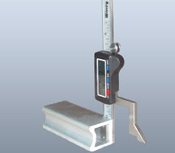 Our Products >> Digital Height Gauge, Sale $50.00. When "close enough" is just not good enough, this precision height gauge will allow you to set you cutting tools, router bits, saw blades, fences and tables to exact close tolerance dimensions. Most digital gauges only read out decimals, WR200 will actually display fraction of an inch or mm making it unnecessary to convert measurements for your project. They are constructed of high quality anodized aluminum along with hardened and ground stainless steel components. Easy to use and guaranteed to improve fit and finish tolerances for anything you do in your shop. Regular price $60. SALE PRICE $50.00.